By striking down limits on aggregate campaign donations, the Supreme Court just supercharged the influence and reach of wealthy campaign donors. Any doubts about the determination of an activist United States Supreme Court to rewrite election rules so that the dollar matters more than the vote were removed Wednesday, when McCutcheon v. Federal Election Commission was decided in favor of the dollar. The court that in 2010, with its Citizens United v. FEC decision, cleared the way for corporations to spend as freely as they choose to buy elections has now effectively eliminated the ability of the American people and their elected representatives to establish meaningful limits on direct donations by millionaires and billionaires to campaigns. The Citizens United ruling, coming after many previous judicial assaults on campaign finance rules and regulations, was a disaster for democracy. But it left in place at least some constraints on the campaign donors. Key among these was a limitation on the ability of a wealthy individual to donate more than a total dollar amount of $123,000 total in each two-year election cycle to political candidates and parties. With the ruling in the McCutcheon case—where the court was actively encouraged to intervene on behalf of big-money politics by Senate Minority Leader Mitch McConnell, R-Kentucky—a 5-4 court majority (signing on to various opinions) has ruled that caps on the total amount of money an individual donor can give to political candidates, parties and political action committees are unconstitutional. In so doing, says U.S. Senator Tammy Baldwin, D-Wisconsin, says the court has further tipped the balance of power toward those who did not need any more influence over the affairs of state. The think-tank Demos says the high court's ruling has "overturned nearly forty years of campaign finance law," which is certainly true. But the court has done much more than that. By going to the next extreme when it comes to questions of money in politics, the justices who make up the court's activist majority have opted for full-on plutocracy—and it is unimaginable that this week's ruling will be the last assault by the justices who make up that majority upon the underpinnings of democracy. 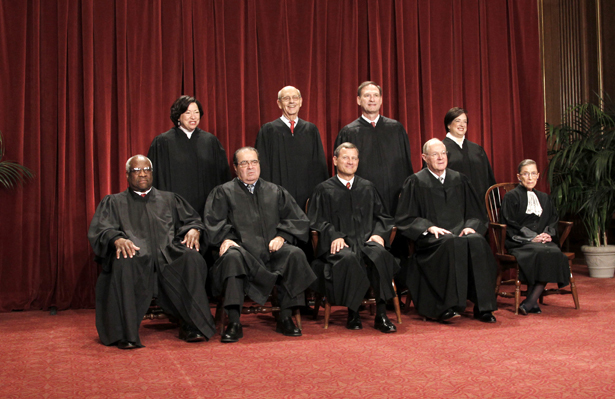 Those justices have made their political intent entirely clear. Chief Justice John Roberts was joined by Justices Antonin Scalia, Anthony Kennedy and Samuel Alito in a support of an opinion that rejects the notion that limits on the total amount of money that can be given by wealthy donors—such as the billionaire Koch Brothers or casino mogul Sheldon Adelson—are needed to prevent corruption. Justice Clarence Thomas went even further, writing an opinion that all limits on political contributions are unconstitutional. The extreme stance of Thomas—which would overturn the high court’s 1976 Buckley v. Valeo, which upheld basic contribution limits, may signal the next frontier for the court. But the McCutcheon ruling will be more than sufficient for the big-money interests that worried that their ability to buy elections was hindered by what remained of campaign finance law. The decision, while not unexpected considering the court's track record, horrified clean-government and campaign-finance reform activists. Public Citizen and other reform groups associated with the Money Out/Voters In movement have organized a national “rapid response” to the McCutcheon ruling. Thousands of Americans are rallying today in cities across the country to protest the decision—and to call for a constitutional amendment to restore the rights of citizens to organize free and fair elections.